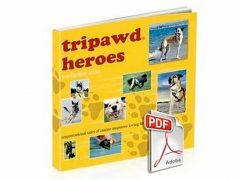 Have you been watching our fitness tips for Tripawds series with Dr.Kennedy and Tripawd Domino? In the following interview with veterinary rehab specialist Dr. Dicki L. Kennedy of ARCC: Animal Rehab & Conditioning Center in Greenville, South Carolina, she discusses the pros and cons of canine prosthetics, orthotic braces for tripawds and amputee dogs. Every Tripawd whether they have a brace or prosthetic limb or not needs to stay strong, fit and flexible. To find out how, watch Dr. Kennedy show Tripawd Mom Cassie and her three legged dog Domino perform flexion, Extension and massage techniques to help Tripawds maintain flexibility, balance and orthopedic health. Stay tuned for our final interview with Dr. Kennedy, where she will demonstrate more fitness exercises for Tripawds! 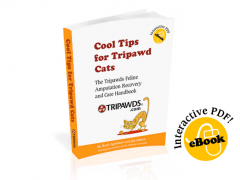 Learn more about prosthetic limbs, braces and orthopedic conditions with Tripawds and OrthoPets. 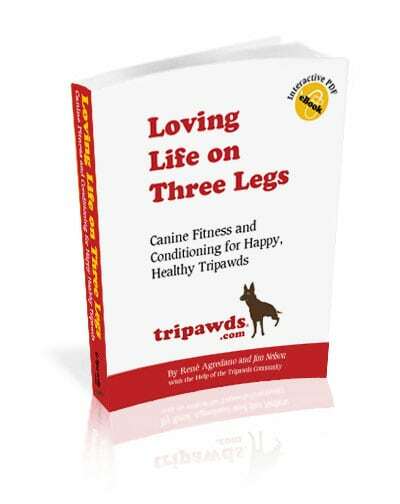 Download the new Tripawds e-book, Loving Life on Three Legs: Canine Fitness and Conditioning for Happy, Healthy Tripawds for all the tools you need to help your three-legged hero get fit and stay strong for an injury-free life.